Going back in time almost as far as we can go, Lunar Lander is one of the last remaining games of the seventies that we have to cover. Its premise? Simple. 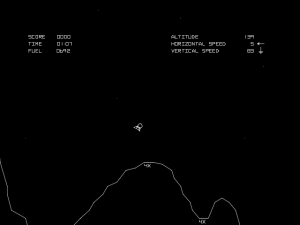 Land a lunar lander on the moon (or some other similar surface… I don’t think it’s that clear). Sometimes, you get a game that does one thing, and does it extremely well. It’s probably the strength of these early games – they have simple graphics, simple gameplay, but are extremely playable in their simplicity. Due to the technological limitations of the times developers really had a restricted freedom whereby not everything was available so they could fully explore one idea (something they, ironically, do not have the freedom to do anymore). Lunar Lander has you land a ship. You can turn it and turn on its rockets to influence its acceleration. You’ve got a few difficulties for the places where you land, giving you different options for scores, but that’s it. Beyond that, it’s about being careful and not crashing. It’s not a game concept filled with hours of play, sure (not these days, at least), but the core gameplay has held up nicely and you’ll certainly want to give it a few goes when you start – first to land successfully, then to land in one of the more difficult places to go to. And in between that, you get to learn a bit about gravity and acceleration as well, to complete the puzzle. Sure, simple and straight forward, but as a diversion, this game is pretty fun. There’s versions online now, so just play it whenever you want to, really. See whether you can replicate that feat.